Both the Princess and the Radiant are beautiful diamond cuts, especially for engagement rings. Some would even say they are very much alike given their squarish shapes. If you’re trying to decide which of the two best suits your choice of diamond jewelry, there are a few basic questions you will need to ask. One of the more noticeable differences between the two cuts can be seen in the diamond’s corners. The Princess, or “quadrillion” cut, has sharp, uncut edges, giving it a more geometric look. The true Radiant features corners that are cut, and is described by the GIA as a “cut-cornered square mixed cut”. Another difference is the shape. 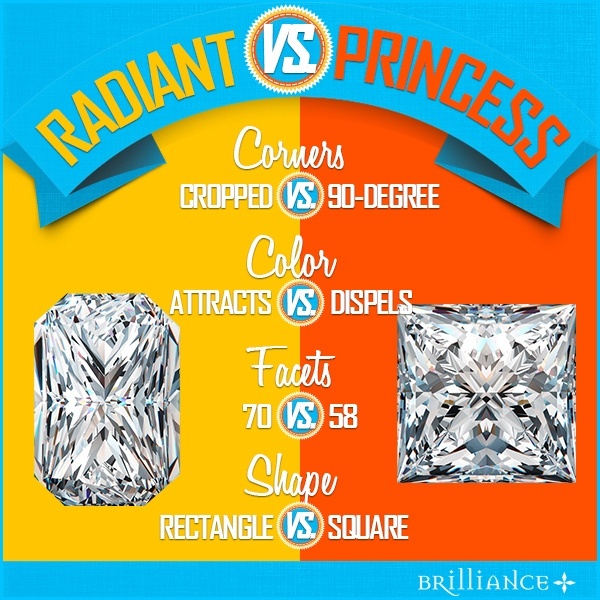 While there are exceptions to both shapes, Radiant cuts tend to be rectangular while Princess cuts are mostly square. Although similar in shape, these two cuts are quite different in popularity. The Princess is a very popular diamond cut, second only to the Round Brilliant Cut. In comparison, there is less demand for the Radiant Cut, so it is not as readily available on the market. When you look closely at a Princess Cut diamond, you will notice an “X” in its center. This is the result of a vertically cut pavilion and chevron-shaped facets. The modern Princess Cut usually has 76 facets, while earlier versions only had 58. Because of its brilliant facets, the Radiant Cut reflects light better than the Princess Cut and therefore has better sparkle, making it a popular choice for engagement, wedding, and anniversary rings! The Radiant Cut was invented by Henry Grossbard in 1977, who wanted to generate more interest for square and rectangular diamond shapes in jewelry pieces. He took the basic shape of the Emerald Cut and added more brilliant facets to develop the Radiant Cut. Not long after Grossbard’s creation of the Radiant Cut, the Princess Cut was born. This new square cut was the result of the desire to retain more of the rough diamond’s weight by altering the Radiant Cut’s facets, thereby avoiding patent infringement. The Princess Cut gives off black and white reflections because of its contrasting linear facets. Which one is best for my lifestyle? The Radiant Cut diamond is better suited for those with active lifestyles because it doesn’t feature sharp corners that can get caught or chipped off with rigorous activities. It is also the best cut for multiple-prong settings because of its cut corners. On the other hand, the Princess Cut features a geometric shape that makes it ideal for those who prefer channel settings. The budget is also a consideration when choosing between the two diamond cuts. The Princess Cut is more affordable than the Radiant Cut because it retains up to 80-percent of its rough diamond weight. It is also cheaper to produce, since one rough diamond typically yields two Princess Cut diamonds.